Note: Shopping through the Amazon affiliate links in this post support this site at no extra cost to you. No Instant Pot? No problem! 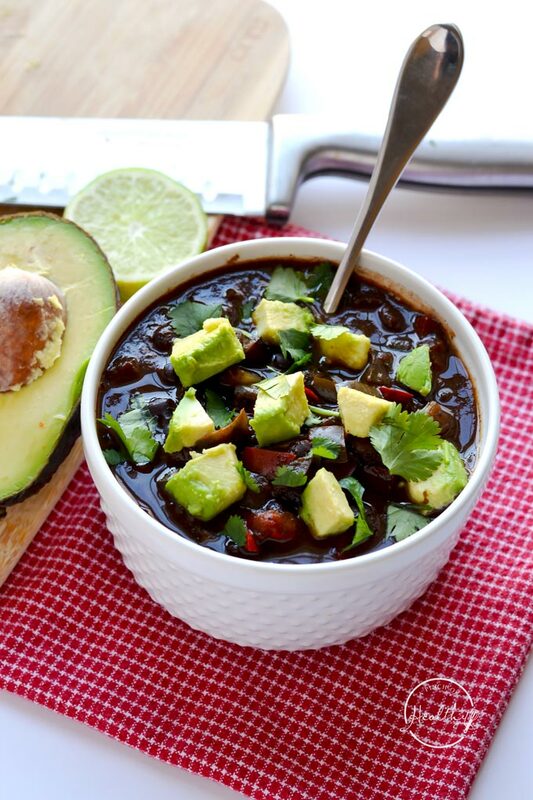 You can totally make this version: slow cooker black bean soup. And here is my full Instant Pot review if you are curious about my current obsession. I love mine! 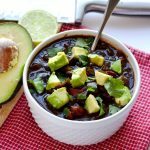 I make my Instant Pot black bean soup with un-soaked, dry black beans. This is where the Instant Pot excels, in my humble opinion. Gone are the days where I need to remember to soak my beans overnight. I just give them a rinse, and I’m good to go. It is kind of life-changing! I use the same method in several more of my recipes: red beans and rice, black-eyed peas and ham and 15 bean soup. And it works great! 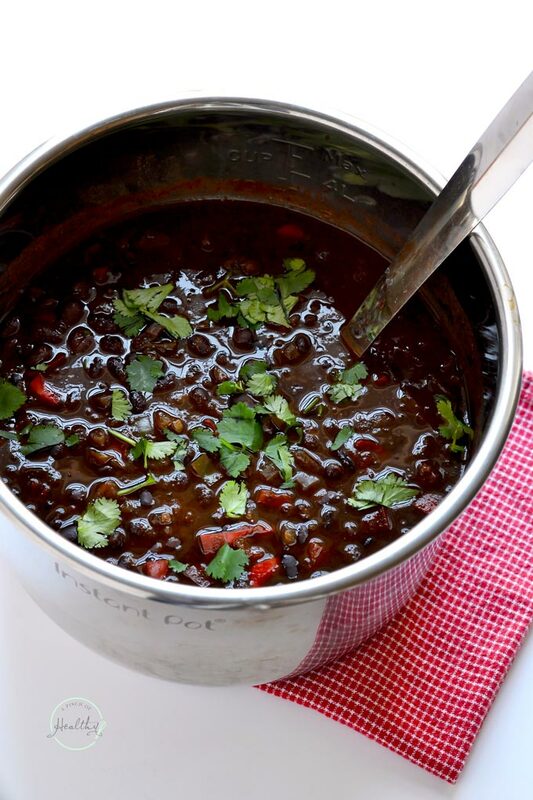 But back to this particular Instant Pot black bean soup recipe. It is a dump-it-all-in-and-press-the button easy. And it is so good that even my son and husband went back for seconds! 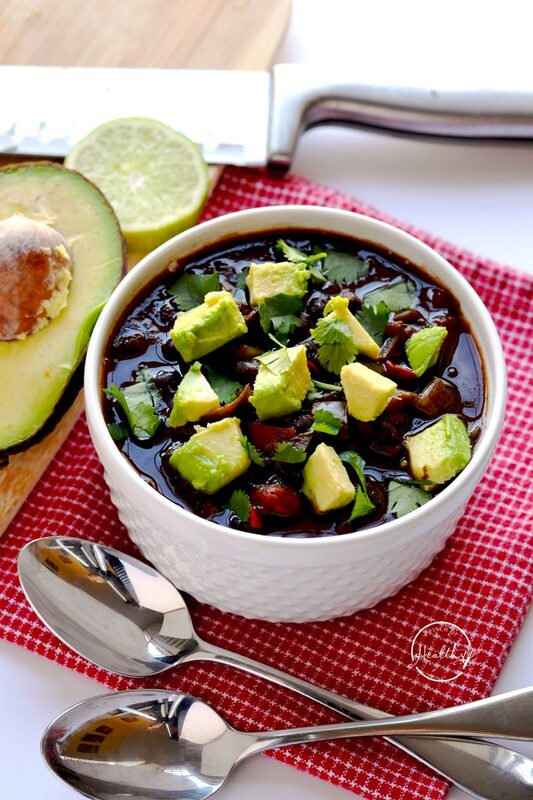 It is rare that I find a meatless meal that makes them happy, but this black bean soup hit the spot. The black bean soup will thicken as it sits. It will thicken even more in the refrigerator if you have leftovers. If you want, you can add a little water or vegetable stock to leftovers to thin is out a little. Also, if you know me, I am all about the toppings on soup! I kept mine plant-based for the photos, with some simple cilantro and diced avocado. Tortilla chips are also good with this. Even a scoop of cooked rice would be good! Lots of possibilities to choose from. 🙂 And omnivores, feel free to add cheese or sour cream! Instant Pot – I have both the Duo60 and the Lux60. Add all ingredients (except toppings) to the Instant Pot, and place the lid on top, with the vent set to "sealing." Cook the soup on manual high pressure for 40 minutes, and let the pressure naturally release (Note: this soup took a while to come to pressure and to naturally release: plan on the whole cooking time being over an hour, FYI). After the pot is depressurized, remove the lid, and carefully remove the bay leaves. (I used tongs). Note: soup will thicken as it sits. Serve with desired toppings: squeeze of lime, cilantro, diced avocado, green onions, tortilla chips, etc. Note: this soup took a while to come to pressure and to naturally release: plan on the whole cooking time being well over an hour (about an hour and 20 minutes). I love the flavor, but the beans were never cooked properly! I cooked them for an additional 30 minutes. Now I have a pot of half-cooked beans and don’t quite know what to do with them. I am wondering if perhaps the salt should be added at the end? I hope to change the rating when I get the recipe right. The beans were probably OLD. You can’t really tell unless they start to shrivel. I take any no-soak recipe and do an instant pot “quick soak,” Then cook the recipe for the amount of time I would cook the soaked beans on their own. I’m going to try that with this recipe. If they aren’t cooked, I do it again for another couple minutes. Sorry about the no upper case – for some reason, this website isn’t registering my shift key. It’s fine elsewhere. Very odd! i made this today and my wife and i really enjoyed it! i used the rotel canned tomatoes with green chilies added, and since i didn’t have peppers on hand and didn’t want to drive to the store, i used jarred smoked red peppers. i also used a bit of smoked paprika with the regular. i served it with added brown rice. very flavoful. I am so glad you enjoyed it! Thank you for taking the time to leave feedback.